This guest post is by Sophia Natasha Sunseri, a Doctoral Candidate in the English department at the Graduate Center (CUNY). The collections at the Morgan Library & Museum span a rich and diverse spectrum, from the ancient Mesopotamian period to the contemporary. As a Graduate Archival Fellow working in the Sherman Fairfield Reading Room, my attention was drawn to the Morgan’s collection of eighteenth- and nineteenth-century “extra-illustrated” books: texts that were enhanced by the inclusion of letters, manuscripts, prints, drawings, and ephemera. Among the primary source materials belonging to the Morgan’s collection of extra-illustrated volumes were two texts that complemented my research interests in particular: Thomas Campbell’s biography of the eighteenth-century English actress Sarah Siddons, The Life of Mrs. Siddons (1834), and the autobiography of English actor, theatre manager, playwright, and poet laureate Colley Cibber, An Apology for the Life of Mr. Colley Cibber (1822). Cataloguing the supplementary contents of these works enriched the scope of my dissertation project, part of which is an exploration of celebrity in the eighteenth century examining how eighteenth-century celebrities may have negotiated their star status by paradoxically concealing themselves through conspicuous forms of self-display. Sifting through playbills, personal correspondence, and prints allowed me to attain a deeper sense of the tangible materials from which celebrity was imagined in the eighteenth century and contributed to my understanding of the ways in which the circulation of such items may have enabled public figures like Siddons and Cibber to elude their celebrity by underscoring the absence of their actual persons. My fellowship at the Morgan has encouraged me to continue exploring this line of thought as I write and edit my dissertation: that is, to analyze the ways in which such artifacts contributed to a tension between visibility and remoteness, allowing celebrities to appear accessible and within reach, while actually at a distance. Anonymous. 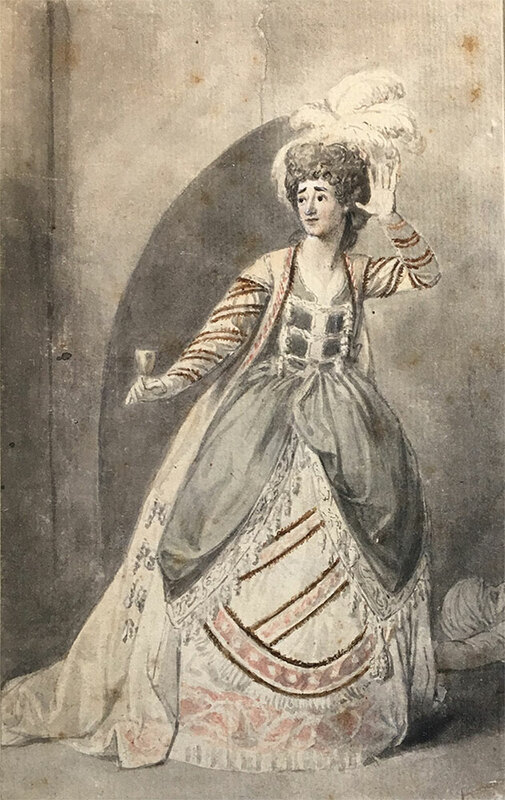 Drawing of Sarah Siddons as Zara from The Mourning Bride, after 1783. Ink wash and watercolor. PML 34397, 1 leaf after page 1; purchased from J.F. Drake, Nov. 1937. 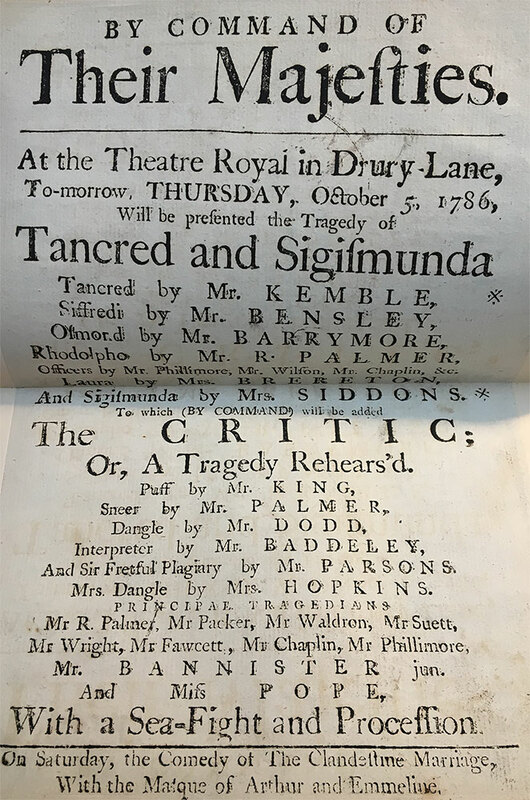 Playbill for Tancred and Sigismunda, Theatre Royal in Drury-Lane, London, 5 October 1786. PML 34398, 5 leaves after title page; purchased from J.F. Drake, Nov. 1937. 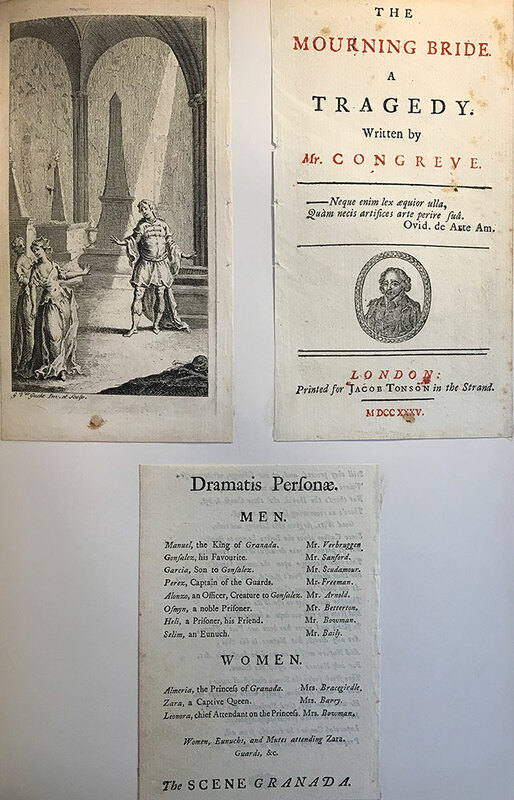 Pages from William Congreve, The Mourning Bridge, A Tragedy (London: Jacob Tonson, 1735). PML 9509, 2 leaves after page 90; purchased by Pierpont Morgan, April 1891. In addition to acknowledging the wealth of primary source materials housed at the Morgan, I also wish to express my gratitude to its employees, without whom this experience would not have been possible. A dedicated staff in the Reading Room led by Maria Isabel Molestina-Kurlat, Curator John McQuillen, as well as the security guards who greeted me at the front desk each morning, all contributed to the work that was completed during my time here. Sophia Natasha Sunseri is a Doctoral Candidate in the English department at the Graduate Center (CUNY), where she studies eighteenth-century British literature. She also holds an MA in Comparative Literature (University of Toronto) and an MFA in Poetry (the New School University). She is currently writing her dissertation, which is tentatively titled Willful Acts of Self-Exclusion in Literary and Cultural Texts of the Long-Eighteenth Century.